The Captain Chadbourne House is a genuine antique Colonial home. Well-maintained, with numerous original features in spacious, beautifully decorated rooms furnished with charming antiques, this is a one-of-a-kind getaway. Downstairs is a spacious... parlor and foyer that opens to the breakfast room, where breakfast will be served daily. Upstairs there are 3 bedrooms to choose from. The Master bedroom has a romantic 4-poster Queen bed with a cozy pillow-top mattress that has been said to save marriages, and a comfortable sofa. The front bedroom has a handsome antique double bed and a loveseat and wing chair. In the anteroom adjacent to the master bedroom are the appliances and a spare bed. We rent to just one party at a time, to provide our guests with privacy. Both the Master Suite and the Parlor have working fireplaces, where a wood fire will be laid for a small fee, or guests can provide their own fire logs. This is a vacation rental with breakfast served daily and a "dorm" fridge for snacks and beverages, No kitchen privileges. An ample and delicious 3-course homemade breakfast is served daily in the lovely beamed dining room. Since we rent to only one party at a time, we're happy to tailor the menu to your preferences! Located in the heart of Kennebunk Village, just a short stroll to shops, parks, restaurants, public library, historic museum, fishing pond, and many other amenities, this lovely home is only 2 miles away from several gorgeous beaches. Beach pass included in the rent in summer, $20 deposit. Kennebunk is a peaceful little town with a great public library, historical museum, parks, tennis courts, a fishing pond, shops, restaurants,churches, and playground all within a very short walk of the Capt Chadbourne House. It's perfectly situated for walking tours of the Historic District and a sprawling historic cemetery. During the summer, the free trolley can take you to the beach and back. For non-beach days, there are several distric3ts of antiques shops within just a couple of miles. Whale-watching, fishing, lobstering, and schooner tours are available from the port, as well as surfing lessons, and surfboard, bicycle, and scooter rentals. Warren King is Music Director at Christ Church in Kennebunk, and wife Jane is an architectural historian and researcher. We bought the Captain Chadbourne House because we fell in love with the numerous original Colonial-era features, such as wide plank pumpkin pine floors, Indian shutters in the windows, beamed ceilings, and many fireplaces. We also love to entertain, and the house has wonderfully gracious rooms for guests. We love to cook, too, and we're sure you'll enjoy your breakfasts! We love the beach, and we love small town life. Kennebunk is a beautiful historic New England village, with miles of sandy beaches, and plenty of conveniences such as shops and restaurants within walking distance of the house. Lovely beaches are just 2-3 miles away. Kennebunk is just an hour and a half drive from Boston, located halfway between the historic cities of Portsmouth and Portland. The Portland International Jetport is just a 25-minute drive from Kennebunk, and Portland itself is a lively city full of history and culture, as is Portsmouth NH. 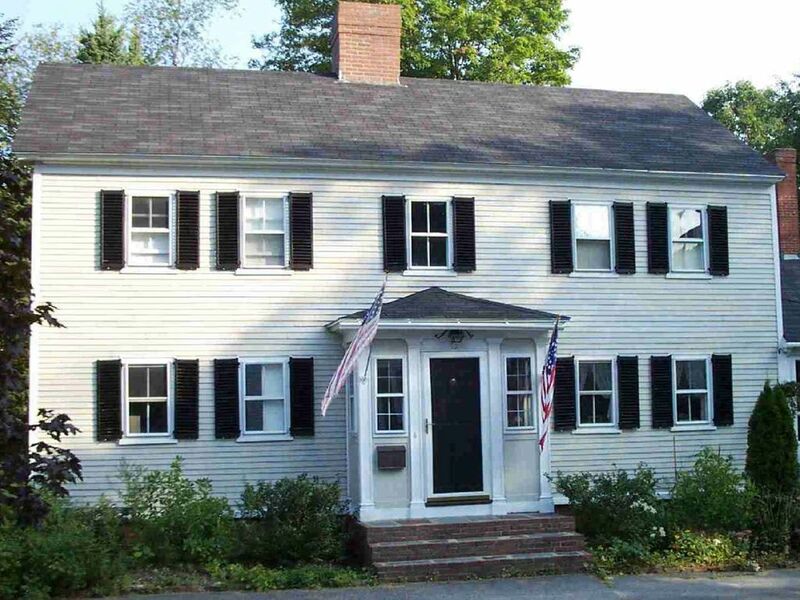 The Capt Chadbourne House is right in the heart of Kennebunk village, an easy walk to restaurants, shops, churches, parks, the public library, the excellent local historical museum, tennis courts, and the beautiful Summer Street ship captains' mansions which make up a National Register Historic District. The Capt Chadbourne House is on the museum's district walking tour! We're also just a short drive or bike ride to several glorious beaches, enjoyable in every season. Capt Chadbourne House is in a walkable small-town center, with great amenities - shops, restaurants, banks, a lovely library, a charming local museum, parks, playground, and historic walking tours. Kennebunk is an attractive, quaint and peaceful village with a full complement of services -- shops, restaurants, recreation facilities, historic features, and friendly, cheerful residents. House linens are provided; beach towels are available for those traveling by air. Fireplaces in Parlor and Master Bedroom. Bathroom towels provided; beach towels for air travelers only. Beautiful and spacious parlor with original 1780's details & fireplace; equipped with games and books; wine glasses on request. Breakfast served 9:00 am unless requested otherwise. Breakfast room open from serving time until guests are finished. Rentals available in Lower Village Kennebunk. Patio and screened porch reached by outside path. Surfing lessons & rental in Lower Village Kennebunk. Breakfast served daily, customized for dietary needs. Your party will have the house and the breakfast room to yourselves, and you can invite extra guests for breakfast if you like - just let us know in advance. Located in the heart of Kennebunk village, walking distance to historic points of interest, parks, shopping & restaurants. Free trolley runs to beaches and other attractions in summer. The house is an interesting historic building but due for maintanence. It was hard to find with no sign out front and overgrown plantings. While the place was very clean, the air was musty and I would not recommend for anyone with mold or mildew allergies. The bed in the smaller attached room was not comfortable and both large beds needed some repair as one of the four posters was loose as was the footboard in the other room. I know the hostess has been ill and they were kind to provide us with a nice warm breakfast on the second day of our stay. Hats off for the Captain Chadbourne House! Staying here was a bit like staying at our family's summer home, that is to say, it was very warm and inviting. We slept well and in the morning our hosts, Jane and Warren, always served up a delicious and hearty breakfast which kept us going for most of the day without having to stop our sightseeing for lunch. Our breakfast was followed up with a short visit by the Kings, always on hand to help guide us in whatever adventure was to be experienced that day. We had a terrific time in Kennebunk, made even more so by our stay at the Captain Chadbourne House. We doff our hats to the Kings! Bob Jan, Mark, and Jill were wonderful guests -easy to talk with, helpful, and a joy to be with - like old friends and a lot of fun. Location is ideal and parking for one vehicle off the road convenient. Our guests said the beds were comfortable and the breakfasts were wonderful. They found the hosts to be delightful. As a guest visiting the premises we found there was a slight musty smell in the downstairs seating area ... and not having a table or chairs that we could sit at was inconvenient. Our guests did say that a television would have been nice. Overall the experience was good. Thank you. Appreciate the 4-star review from the person who arranged this stay for others, and spent just a little a time at the house. It's a 230- year-old house, not surprising it's a little musty, but you made us think about how to control that better - thanks for that! We don't understand complaints about inadequate parking, as we often entertain groups with 3 or 4 cars; or inadequate seating, as the parlor has seating for 8, and a long low table to sit around, as well as a desk for writing or note-keeping. A TV is just not part of the package, but Wi-Fi is available, with passwod. We're very glad the guests enjoyed their stay; we certainly enjoyed meeting them. Charming antique colonial, congenial hosts. We (2 couples) recently stayed at this property for a long weekend , and couldn't have been more pleased. The house is set back from the main road and is surrounded by trees and shrubs, so it doesn't give you a wow 1st impression. However, upon entering the house, you could really feel the history of this grand old house. It is decorated with history in mind, and it provided everything that we needed, including awesome beds and A/C. With all that said, what makes this property so special are its hosts Jane and Warren. They made us feel right at home immediately. It was not a show; it was true hospitality. Every morning they served a breakfast that included homemade blueberry pancakes, peach cobbler, and blueberry muffins. They were genuinely interested in our lives and shared many stories about there adventures. They also helped us immensely with restaurant and tourist recommendations. I would highly recommend this property to anyone visiting Kennebunk or Kennebunkport. My daughter, granddaughter and I enjoyed our stay in this historic home. Jane and Warren were gracious hosts. Jane prepared delicious breakfasts for us during our stay. We were disappointed at not getting to go on a whale watching tour but Jane located other tours we could enjoy, which we did. The overall ambiance of the home was charming. As with all centennial homes, it could use some updates; however, the quaintness of the home was enchanting. Personally, I enjoyed the no TV and AC. The fresh air was a change. We were awakened every morning by singing birds which is also very nice to wake up to instead of blaring alarms or radios. If you are looking for a place to stay that takes you back in time, this is the place to stay. We would recommend this home mainly for adults because the unique setting would be a little benighted for kids, but adults would certainly enjoy the serenity of the home. The location is perfect and close to everything. A bit far for the beach if you are walking but you can rent bikes or go for a drive; it is not far at all. Overall, we give 5 stars. Walking tour of historic ship captains' residential neighborhood & historic cemetery. Whale watching, lobstering,fishing, and lighthouse tours, schooner rentals; surfing lessons; surfboard, bicycle, and scooter rentals. Children are charged the same as other guests. Base rates are for 1 bedroom, 2 people; for additional guests, add $40/night/person or $500/week. A substantial breakfast is included in all rates; no guest kitchen privileges.